Twitter User Compares Pakistan Captain To Shah Rukh Khan, Gets SLAMMED From Both Countries! Pakistan cricket captain Sarfraz Ahmed received a huge welcome as he arrived home carrying the ICC Champions Trophy early on Tuesday. Karachi airport was packed with hundreds of people who arrived just to welcome Ahmed. However, a Twitter user stepped into the lion’s den by comparing Ahmed’s fame to that of Shah Rukh Khan’s. 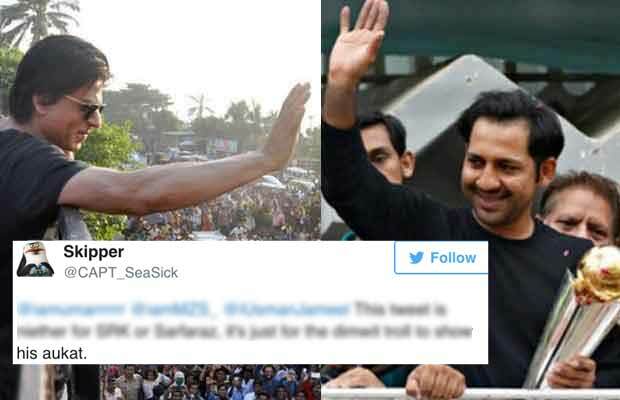 Twitter user @iUsmanJameel, shared pictures of Pakistan Captain Sarfraz Ahmed being welcomed back home with a caption, “SRK who?”. SRK he who’s films have more crowd than this.. that too in theaters Karachi, Islamabad & rest of Pakistan. This tweet is niether for SRK or Sarfaraz, it’s just for the dimwit troll to show his aukat. waise to reply pane ki aukaat nahi h teri par lele..
Bhai galat fans se panga le liya tune ab to tweet delete Karna padega tujhe ?? Previous articleWhen Salman Khan And Shah Rukh Khan Shot Together For Tubelight! Next articleBigg Boss 11: Here’s Good News For All Bigg Boss And Salman Khan Fans!